Lately, things have been unusually quiet here in my little facet of the bead universe, but that’s hardly a reflection of real life. Earthquakes, hurricanes, tornadoes and floods … unless you’ve been living in a complete news vacuum you know that all kinds of freaky natural disasters have hit the east coast big time in the last month. In fact, I was just sitting around the other day waiting for frogs to drop from the sky, when a wonderful 15-pound Golden Retriever pup fell into my lap instead. Meet Truman, our veritable teddy bear of a dog; he has been with us about 4 weeks now and is shaping up to become a fine addition to our family. If you’ve followed this blog before, you may recall a few pics of our beautiful yellow lab, Stella. She was, in all seriousness, one of my best friends ever on this earth, and still 6 months out I can bring myself to tears in about 30 seconds flat just thinking about her. But we had to say our final goodbyes last January, and after a long time mourning we decided that summer would be the right to welcome a new pup into our lives. What can I say? The fresh, sweet smell of puppy breath, their soft fur, the cute way they run through a field when chasing after a boy who has dog treats in his pockets … it’s been an ideal way to end a wonderful summer. And now Truman and I are settling into a nice domestic routine of sitting around drinking coffee, playing on the floor, sleeping and writing while the boys are at school (for the record: I drink the coffee, and he does most of the sleeping ~ though I am thinking about sneaking in a quick nap later this afternoon if at all possible). He doesn’t even know about beads yet. I’m a little worried about him eating beads that he finds on the floor (Lord knows I wouldn’t want to go on a search and rescue mission for any that go missing), but I am thinking he might look quite handsome with a little extra bead or two to complement his dog tags. 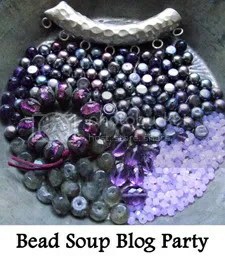 Will find my way to the bead table soon enough — Saturday is the big bead hop reveal for our Soup challenge, so I best get started. Honestly, it’s a little embarrassing to admit, but I’ll go ahead and be the first to put it out there. Beautiful beads have been known to make me salivate. And feel a little flush in the cheeks. And then I just stare at them all dewey-eyed, wondering how in the heck I’ll be able to do their beauty justice in a piece of jewelry made with my own two hands. 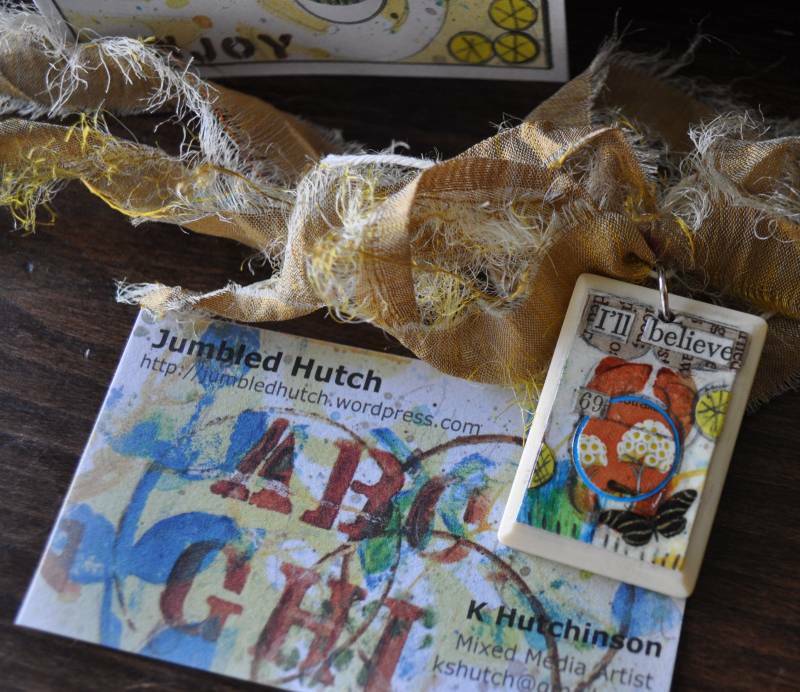 So you can imagine my delight when my bead soup package arrived the other day from my partner K Hutchinson over at Jumbled Hutch. She is an Uh-MAZING visual artist. She paints. 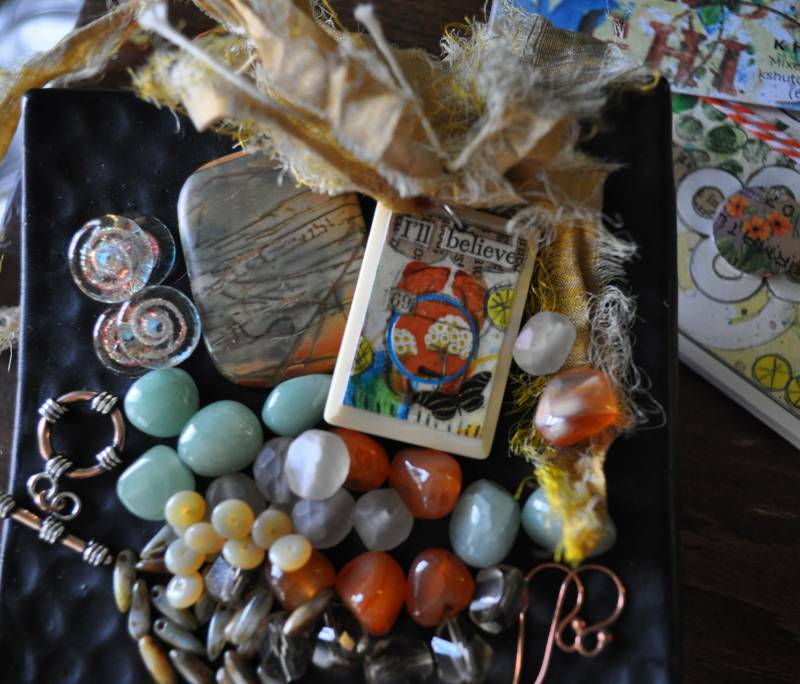 She makes very cool mixed media beads like this. 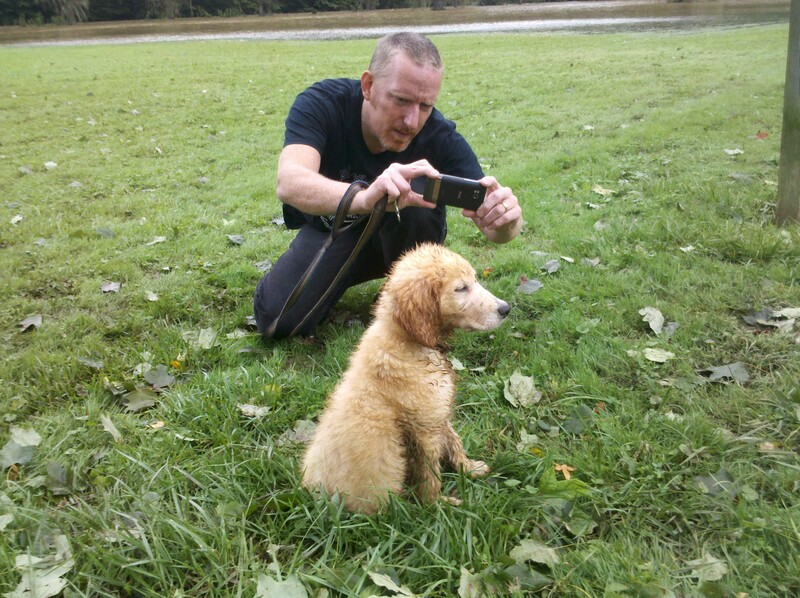 She takes fantastic photographs everyday ~ and blogs much more steadily than yours truly. And she sent me the most delicious soup mix. K is so incredibly humble and gracious about her work, she sent me the sari ribbon and handmade pendant as a gift on top of my soup mix. But I tell you, just one look at the photos and I think it’s pretty clear that I’m going to have to incorporate that tasty bead she made into my design somehow. Doesn’t it just pop right to the top? If beads had a scent, this one would smell like fresh bread coming right out of the oven. Or cinnamon rolls perhaps. Of course, being a few days behind on this project, I realize that I never posted a picture of what I sent K … Please take a look at K’s photos of the beads she received (for some dumb WordPress reason if I try to post my own pics in this post it messes up the gallery shot above). Anyway, you’ll want to stay tuned to see what we create with all of these lovely supplies. Here’s a link to the list of other blog participants ~ the big reveal is September 17th. I’m sure I’ll be blogging about my creative agony before then, but something tells me this particular batch of soup is going to go down pretty easy. Looking forward to seeing what my new bead soup partner chooses to send my way ... regardless, I'll be needing a fresh batch of headpins soon! Sure, it’s “hotter than Hades” outside (according to my 10-year-old and resident mythology experts). But it’s August after all. Should we really expect otherwise? Fortunately, that doesn’t mean it isn’t a great time to step into the Bead Kitchen (bear with me — my brain is slightly overheated and the metaphors are jumping all over the place in my brain). 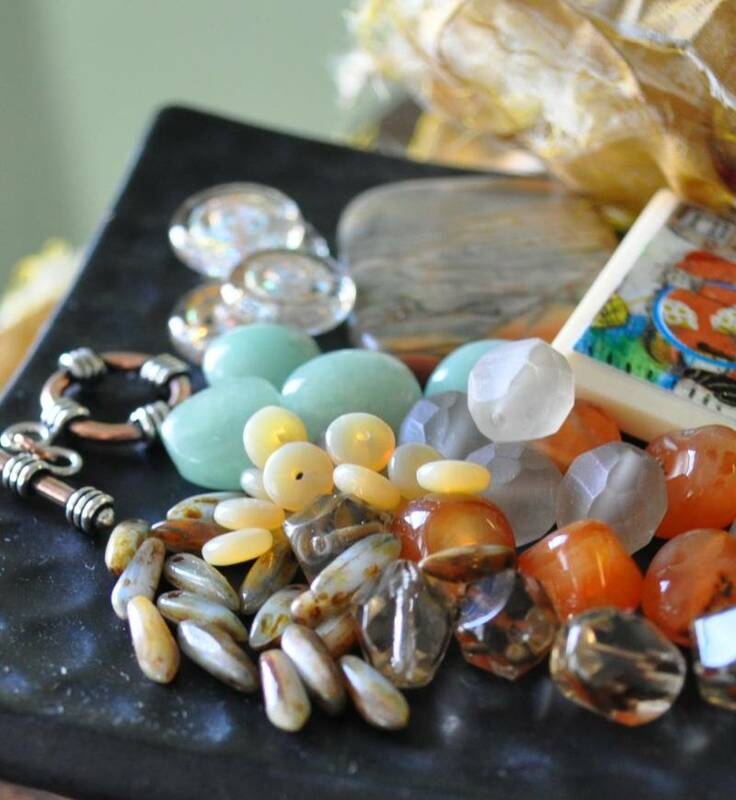 Thanks to the magnificent Lori Anderson, a lamp work artist extraordinaire and amazingly generously blogger, I’ll be participating soon in my THIRD Bead Soup Challenge. 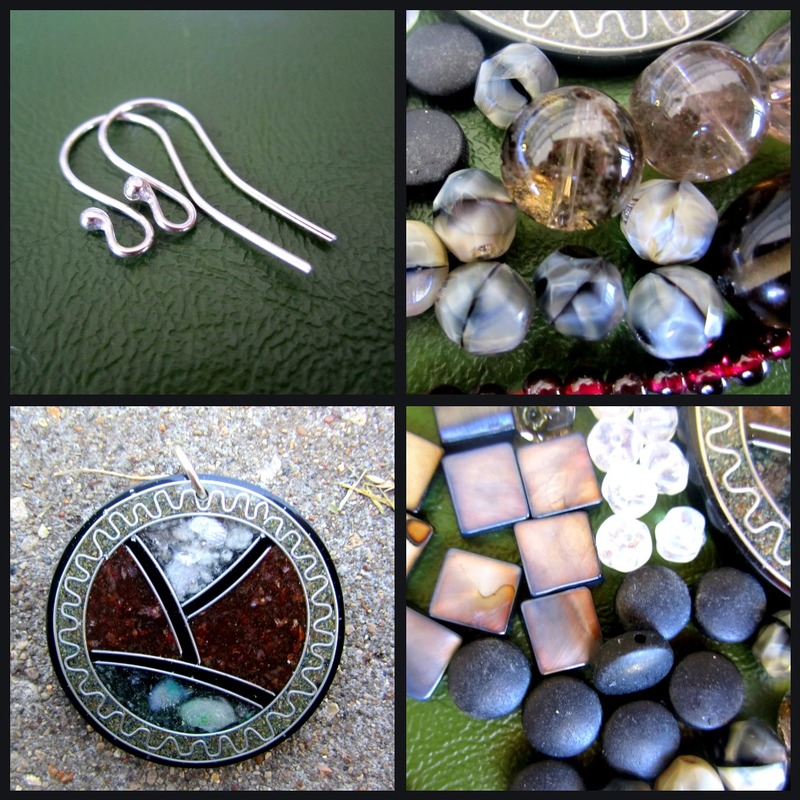 It’s such a great way to push my creative boundaries, and I LOVE, LOVE, LOVE exchanging materials with other bead fanatics such as myself. If you want to know more about the challenges, click on the button on the right. Here’s a link to the other pieces I’ve made in previous challenges (this is a link to the first one, and here’s a link to the second). Lori will be posting a list of all the participants for this round shortly. I can’t wait to see who I’m paired up with. Plus, with all our fun vacations of the summer now wrapping up, the challenge will be a welcome break from all the work that has been piling up around me. Are you participating? With so many people involved, it would be great if you would leave a comment so I can make sure to follow you, too. Well I’d love to be one of those regular bloggers who puts videos into their posts, but for the life of me I can’t figure out how in the heck to get this to work. Here’s a link to the video I wanted to show you. 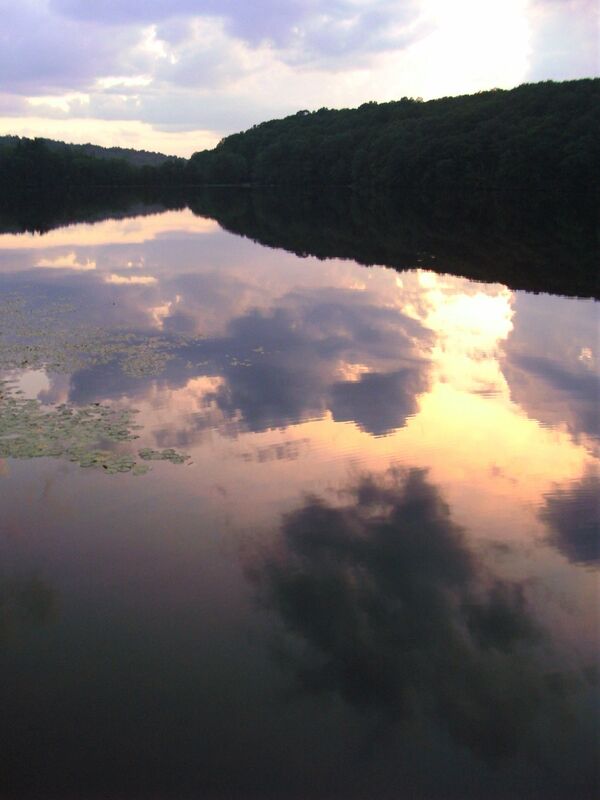 Given this heat wave, I’d give anything to be on that lake right now. And for the life of me, every time I hear Eli give that Tarzan yell it cracks me up. However, I do wish that this sort of technical conundrum didn’t make me want to pull my hair out, spin my head around a few times like Linda Blair and stomp on my computer until it was reduced to a trash heap of wires, plastic and broken glass. The reason I’m prone to such tantrums? Let’s blame it on the smart phone, shall we? About a year ago I received an Android for my birthday, and very quickly that little phone became my life link to the outside world. Suddenly I was able to give meaning to those many idle minutes spent waiting for my kids to come of out a building when I’m playing mom taxi, or waiting for a concert to begin, or waiting for friends to meet me for lunch, or riding a bus, or … well, you get the picture. And if you’re part of the 21st century, I’m sure you’ve discovered the pleasure of a smart phone, too. But what about getting that little piece of plastic to do your bidding? Naturally I was thrilled to learn there were Etsy apps that let me stay in touch with my store without being in front of my actual computer screen. And signing up for Square Up made my last trunk show a resounding success. The day that I figured out (by myself, thank you very much) how to “tether” my phone so I could use it as a modem for my laptop? HEAVEN! So the day that I was at the cabin with my sister and she started talking about wanting to upload videos from her phone to Facebook … I felt like a master of the universe when I found the app that could help me do that. The little clip I linked to above went straight from my phone to the FB universe in about 10 minutes. Imagine that! But let me tell you, folks, that ecstasy came crashing down around me this evening as I tried (unsuccessfully) to embed a link to the above video into my little Word Press blog. Truth be told, my method for troubleshooting doesn’t extend far beyond “copy link / paste link / preview post / grind teeth / repeat,” and I probably should have given a holler to my dear husband who is the resident computer guru of the household, but a strange mix of pride and desire for technological independence kept me from going that route. Maybe he’ll read this post and figure out a way to offer a few gentle “pointers” that don’t make me feel like a complete loser. Are you picking up on this, honey? These lovely little earrings don't have a thing to do with my living room, but they are part of the newest additions to my little Etsy shop. I don’t know about you and how you react to situations that require you to suddenly shift gears, but for me the answer is clearly D (or perhaps just “A” if you happen to be one of my dear, long-suffering family members). So what’s changed? Not as much as you might think. Just our complete family schedule now that my boys are home for the summer, and thus in and out of my work space throughout the day. As well as several fun editorial projects that involved a great deal of thought and concentration. And our living room. Yes, our living room. I’d share before and after shots if I had thought to take them, but this one came upon me as a complete surprise. It all started when our eldest decided that the large antique family portrait of complete strangers that I picked up in a thrift shop 20 years ago because of its cool frame … well, he decided that it was giving him the creeps, and that all of our wall hangings should be swapped out for a change of scenery. And then he went on a wicked cleaning binge and reorganized all the crap that had been slowly creeping into the corners of the room for years (he even put all my knitting stuff in clever baskets he reclaimed from the top of the bookshelf ~ seems there are real positives to being the tallest person in the household). He moved carpets, lighting fixtures, and even swapped out some furniture that we’d stored in the basement. Basically, he did all the things his parents probably should have done over the years. And he did it all without the slightest bit of complaining. Ironically, he chose to replace the “creepy” antique picture with a huge poster-size portrait of me as a child … just a little something my artistic uncle made some 35 years ago that Isaiah found tucked in a tube in one of the aforementioned corners. Think Warhol’s Jackie O series meets a Dennis the Menace-like kindergartener with a green fuzzy ribbon in her hair. Now why he doesn’t consider that picture horrifying is beyond my wildest imagination, but I have to admit the new diggs are growing on me. So how does a change like that get even better? We secured a tentative agreement from him to consider painting the living room next month, provided he gets to have input on the paint colors (by now Stan and I are starting to see the benefit of letting him run with these sorts of ideas, so I don’t anticipate he’ll face much resistance from us on his selection). Of course, the really embarrassing thing about this situation is that the last time we painted the living room we were new homeowners and he was the baby who watched us from the comfort of his wind-up swing. I suppose I could play this off as part of a big plan on our part to have our kids start showing a little ROI, but the truth is we were completely blindsided (and delighted) by this recent turn of events. It’s not exactly like “trading spaces,” but it’s close. 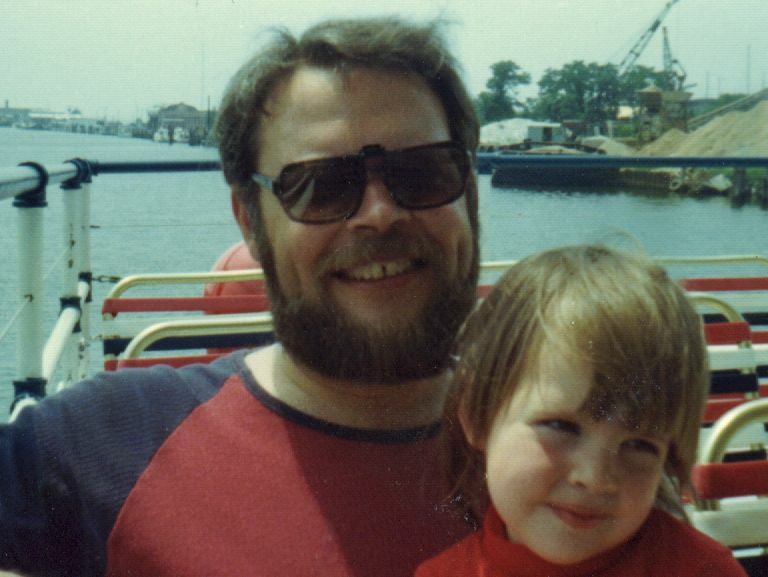 As you might expect, I was going to share a jewelry picture in this post, but my dad’s amazing dimples got the best of me in this snapshot, so I decided to include it instead. But as for the jewelry in question, there’s this quasi-tacky button sort of pin that my dad gave me a few years before he died that I’ve held onto like the Hope diamond. So I tried to take a few pictures of it to share here on Father’s Day along with some memories, but the truth is it’s something I’ve never worn (probably because it is plastic and in the shape of a little house painted metallic blue with silver hearts on the doors and windows) and the pictures were just sort of crap. Of course, this is not to say that he had poor taste in jewelry. I have many vivid memories of standing beside him at the counter of Murray’s Jewelry Shop as he looked at what seemed like thousands of beautiful options before selecting yet another perfect gift for my mother. But in this particular case, the way the pin looks truly doesn’t matter. This little house-shaped bauble was probably picked it up on a lark at a Habitat for Humanity fundraiser, an organization that my dad was very involved with in his later years. He didn’t buy it for me because he thought I loved blue plastic houses or lapel pins. He bought it because he wanted to support a mission that could change people’s lives. And (I’d like to think) he probably thought it would look better on me than him. So why have I held onto it all these years? Because it reminds of one of the best lessons he ever taught me … you have to look beyond the first impression to see what really matters.